Our windsocks are solid, robust, effective and most sizes are proudly made in Australia. They are ideal for commercial airports, industrial sites, mines, factories, vehicle racetracks, freeway bridges, heliports and marine moorings. Our large and medium windsocks are made from extra heavy duty fabric, they are much stronger and will last up to 50% longer than most other brands of windsocks. What does the Woomera rocket range, Mt Isa mines, Bundaberg Rum and Melbourne Airport all have in common with each other - they have all used our windsocks! 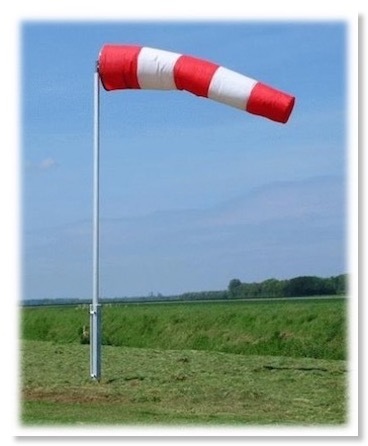 The standard aviation windsock is large, it's manufactured with the highest quality fabric available, has a 3 foot diameter mouth and is 12 feet long. These windsocks come complete with a flexible lightweight rust proof hoop sewn into the fabric to hold the windsock open and in place when attached to a windsock frame. For airport operations "white" is the primary windsock colour "yellow" is the secondary windsock colour. Manufactured to Civil Aviation Authority recommendations. 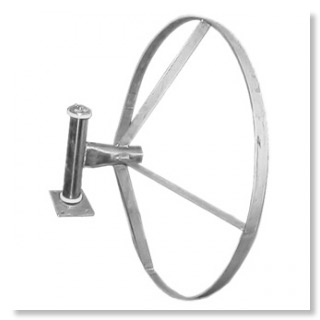 Don't forget to order a stainless steel windsock frame to mount your windsock (see bottom of page for more info). The standard fabric used on our medium and large windsocks is heavy duty, and UV stable. The quality is higher so the cost is a little higher, however the longer fabric life really justifies the purchase of our windsocks. Standard windsock colour, white or as an option, yellow. A full sized 3 foot opening, 12 foot long commercial windsock, suitable for airports/freeways/marine applications, made with heavy duty rot proof fabric. Light weight duty also available at a lower cost. Regular (road) delivery $39.90. Please contact us for international delivery prices. IMPORTANT : Australia Post has decided it no longer wants to deliver airport windsocks! A big thumbs down for our postal service!! Please give us a delivery address when ordering that does not use a PO Box. This delivery address limitation only applies for the standard (Large) windsocks. HEAVY DUTY model ONLY $219 each. Please use the correct windsock frame with your windsock, otherwise the life of the windsock will be reduced dramatically. SMALL AIRFIELD or LARGE INDUSTRIAL SITE. A 2 foot opening (600mm), 8 foot long windsock, for small airfield, helipads, farms, industrial sites. Heavy duty rot proof fabric, hoop sewn into windsock for easy mounting. Light weight duty also available at a lower cost. Regular (road) delivery $33.90. Please contact us for international delivery prices. HEAVY DUTY model ONLY $189 each. For airport operations "white" is the primary windsock colour "yellow" is the secondary windsock colour. A strong windsock that has an 18 inch opening and is 5 foot long. Ideal for industrial and building use or small sport aviation airfields, no hoop sewn into fabric to reduce freight costs. The fabric weight and strength of this windsock is lower than that of the medium and large sized windsocks, it needs to be this way so that our windsocks "fly" correctly. 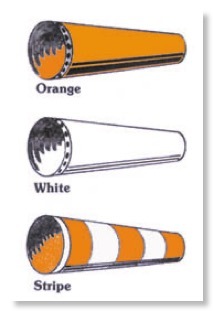 Your choice, a twin colour, good looking orange and white windsock, it's sewn together in bands for improved visibility. One colour, lower cost, orange or white windsocks are also available in this medium duty fabric. In normal conditions the "medium duty" windsocks will last at least 3 times as long as our "light duty" windsocks. Fabric imported from the USA. Express Pack delivery $18.90. Orange, medium duty windsock, $166 each. White, medium duty windsock, $166 each. SMALL WINDSOCK - Light Duty, short term life. An 18 inch opening, 5 foot long windsock with no hoop sewn into fabric to reduce freight costs. Suitable for short term applications, trade shows, markets etc. The "light duty" orange colour windsock will fade to white over time. As a guide expect 6 months service life. If you need a heavier duty windsock that will last longer we recommend the medium duty windsock (see above). 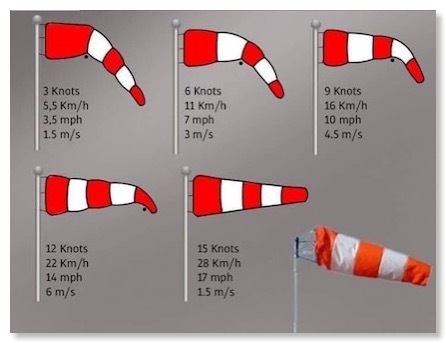 Please note it is also important to use the correct windsock frame with your windsock, otherwise the life of your windsock will be reduced dramatically. Australia Post express mail delivery $16.90. Available by with an email or phone order only. To order is easy, we accept credit cards, Australia Post COD, and we can email you an invoice prior to a sale if needed (please note this will delay the purchase process, payment is still required before dispatch). Please email your request to mail@aeroshop.com.au, or call 0422 446622. For PayPal credit card or bank transfer orders please use the shopping cart buttons to get started. If you have a good quality windsock you also need a top quality frame to support the windsock and to allow it to swivel correctly into the wind. Our solid windsock frames are constructed from industrial grade stainless steel with the design including a "no tangle" stand-off stainless steel hoop. The size of the windsock mouth opening is matched to the stainless steel hoop on the windsock frame for easy mounting. The frame is designed to hold the windsock open and clear of a windsock pole. Our windsock frames are designed around a vertical stainless steel post with 4 solid welded stand-off steel straps and a steel hoop for attaching the windsock, at the bottom of this post is a horizontal welded mounting plate. This plate is normally connected to a matching plate on the top of a windsock pole. The size of this plate is 100mm long x 75mm wide x 5mm thick, +/- 1mm with the centres between between the four (4) bolt holes being 3 inches on the long side and 2 inches on the short side. It's best to drill the holes in your own mounting plate after you get the frame - just to be on the safe side. Simple "easy care" rust proof bearing surfaces are standard. At this stage we do not sell windsock poles due to the high delivery cost. Secure PayPal payment is available, using your credit card, use the order box below (for delivery anywhere in Australia). Contact us direct at mail@aeroshop.com.au or phone 0422 446622 if required. Prepayment with an order is required. For deliveries outside Australia please email for a price.